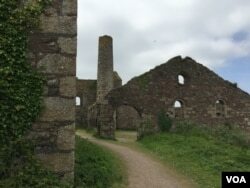 For southwestern England's Cornwall region, Britain's membership in the European Union has meant a big cash infusion and new promise for people living among the ruins of tin mines that once were the symbol of innovation and industry. When the last mines closed years ago, the area's economy collapsed and thousands were plunged into unemployment and poverty. Cornwall was known as the "Poor Man of Europe." It was in that environment that Toby Parkins grew up. "I had a choice to work in mining," he said. 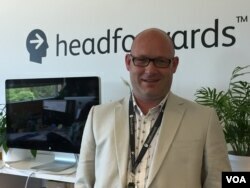 Instead, he went into the software business and now runs Headforwards, a booming software development company. "We're going to be doubling in size in the next 12 months in size, really, realistically, and it doesn't look like it's going to stop. It looks like we're going to be accelerating. Yeah, it's good times," Parkins told VOA. He attributed his company's success to EU support that has financed infrastructure projects like the innovation center where his offices are and a massive broadband expansion project that has allowed his company to serve global clients. The support is substantial. From 2007, after the EU qualified Cornwall as a less developed region, Brussels pumped more than $740 million into infrastructure projects. By 2020, another $700 is budgeted, making Cornwall a top recipient of EU money in Britain. Business boosters say the difference the EU support has made is huge. 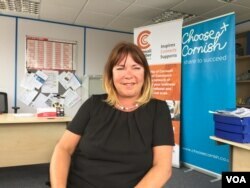 "If you'd been here 10, 15 years ago, Cornwall was a different place than it is today," said Mel Colton-Dyer, head of business connections at the Cornwall Chamber of Commerce. Nathan Brown, a software developer at Parkins' firm, says Brussels has delivered. He sees the June 23 vote on whether to remain in the EU as potentially life-changing. "At the moment I can't do anything but think about it," he said. Brown feels lucky to have a job that pays well in a place where there are still not many other options. "I found it very difficult to find programming work down here, with an adequate salary." But economists note the region's GDP has not risen significantly and the high-salary jobs are still few. "We'll hear stories of businesses that have done well, but in my view, there should be 10 times that, 20 times that," said Rob Misselbrook, owner of Mylor Ventures, a venture capital company in Cornwall. He says the EU infrastructure has helped, but thinks it is time to let the private sector take over. "Businesses should drive the economic growth." he said. "I call it the blob, which is this huge advisory ecosystem that we have here. We have advisers coming out of our ears," Misselbrook said. "I would really argue what their impact is in terms of delivering sustainable growth. The funding stops and they disappear." Analysts say the lack of tangible benefits like higher incomes could explain why, despite the EU cash infusion, Cornwall is a hotbed for the campaign to leave. 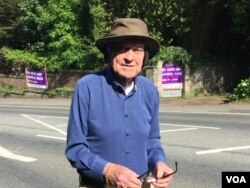 A reporter approached resident John Hodgson as he nailed a pro-leave poster on his fence. "I love England," he said. "Britain used to rule the waves, you know." At 78, Hodgson remembers World War II vividly, and the Brexit vote is, for him, a question of sovereignty. "The reason I think we should pull out is we like our freedom," he said. "This could be like what Nazi Germany did, and we don't forget what they did." Locals complain that Cornwall's historic fishing industry has been decimated, and they blame EU competition. But the big issue is immigration. On Falmouth's picturesque waterfront, Mark Jackett, a retired builder, has strong views. "People are coming in. The Polish, very hardworking people, but to some extent they're coming in and working for less wages, which is putting pressure on the local person who's either got to accept lower wages or don't work," he said. Cornwall's younger generation expresses different views. "Leaving would be such a massive change that you just can't predict what would happen," said Charlie Evans, a student at Falmouth University, built with EU money. "But staying, I don't think too much would change. 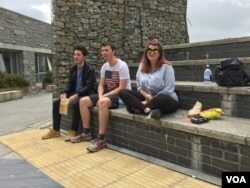 I know Cornwall benefits greatly from the EU, this campus particularly," he said. Another student, Libby Cadman, agreed. "I think the impact of leaving will actually be so negative on this generation that it won't be worth it." Toby Parkins worries that new immigration rules possible after a Brexit could hurt business. "We already deal with international visas, and trust me, it's an absolute nightmare," he said. "We've lost candidates. We've lost contracts in the past because we haven't been able to recruit people fast enough. It's a real dent on productivity." He is looking to shift part of his operations to Estonia or Spain.